A very poor result for Villarreal who suffer their first defeat under new boss Lotina. Villarreal enjoyed considerably more possession than their opponents despite playing the final 24 minutes of the match with just 10 men following the dismissal of Angel and yet they seldom looked threatening, weaving pretty passing movements in the middle of the pitch and unable to hurt Betis. The consolation goal arrived in the 92nd minute courtesy of a penalty. All of the interest from a tactical perspective came via Villarreal and Lotina’s initial line up followed by his changes. Both sides entered the game on the back of 3 match unbeaten runs but still needing points to climb away form the relegation zone particularly the visits who started 4 points behind their hosts. Pepe Mel signalled his intention from the outset with an attack minded 4-4-2 line up featuring Benat in midfield, wingers Pereira and Montero and a strike partnership of Santa Cruz and Castro. Considering Mel featured two wingers and Villarreal adopted a narrow approach, this was always going to be a key feature of the game. With a reputation for a conservative approach to games, and given their precarious position in the table, Lotina went with just one striker up front in Ruben. The formation was a loose 4-2-3-1 / 4-3-2-1 with the key player being Angel. Normally a right back, Angel started on the left hand side of the midfield but appeared to be neither attacking nor defending particularly well, shuttling between both. Perhaps unsurprising given he was on the wrong side of the pitch. Bruno dropped between the centre backs when in possession and the full backs pushed very high especially Oriol on the left. Senna adopted a defensive position on the right of midfield which left Valero and Cani to support the lone striker of Ruben. This represents a departure from the traditional Villarreal approach based upon a 4-4-2 utilising interiors. It was this approach that proved successful under Pellegrini and initially worked for Garrido. It relied heavily upon the full backs pushing forward to provide the width, which happened here, and also upon varied movement from the two strikers, which did not happen here via the lone striker. Given the importance of the game, neither team really took control of the game early on although Villarreal dominated possession and gradually began to exert more control through the midfield area. Villarreal still retain a South American style approach with a relatively slow tempo when in possession. The movement of the midfield across the pitch to form short triangular passing movements was also evident in patches as they overloaded Betis to work the ball and create space. Where this approach failed however was further forward. Ruben does not offer the level of mobility that Rossi or Nilmar can. Betis were content to defend deep with two narrow banks of four forcing Villarreal to go wide but the delivery into the box was not of a suitable quality. Borja Valero began to drop deeper as the first half progressed and became more effective as a result. Under Pellegrini and Garrido, Valero was used as one of the defensive pivots sitting in front of the back four. In addition to his defensive covering reading the game, he also recycled the ball quickly and efficiently. When playing in a more advanced position, the team loses his passing ability to construct moves and the relative lack of pace and mobility in his game is highlighted. Both goals for Betis were the product of poor defending from Villarreal. On each occasions, the ball was delivered from the Villarreal right, Senna not closing down his opponent quickly enough, and on both occasions Villarreal appealed, unsuccessfully for offside. Another key component of the successful Villarreal side was their ability to play a successful offside trap. The second goal demonstrated how that is no longer working with Gonzalo rashly pushing out following a poor headed clearance and the three remaining defenders staying deep and playing Ruben Castro onside. The second half began with Nilmar replacing Senna and Villarreal switching to a 4-1-2-1-2 formation. Angel moved to a more natural position on the right of the midfield diamond and Cani went to the tip, supporting Nilmar and Ruben. The 3rd goal for Betis was again self-inflicted from Villarreal’s’ perspective. A dreadful attacking free kick was easily cleared and a quick Betis counter led to Benat scoring. Put simply, Benat seemed to show more desire than both Oriol and Bruno to reach and control the ball and then slot home. Betis also tried to hold an offside line around the edge of their 18 yard box which highlighted the lack of movement from Villarreal. There were occasions when Villarreal had 4 or 5 players in a line across the 18 yard box as Betis held but nobody came short for a pass or made a run in behind the Betis defence. It seems strange that Lotina chose such a narrow formation particularly when Betis were utilising Pereira and Monero on the wings. Both first half goals from Betis originated from wide positions although there was arguably no inherent tactical success in either. Both were just poorly defended goals. The positioning of Senna on the right and Angel, a right back, on the left handside of the midfield diamond was bizarre. 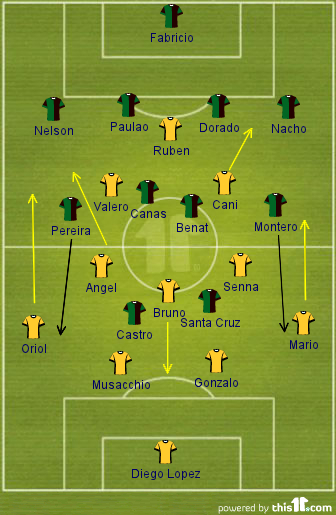 Senna appeared uncomfortable when pulled wide, and did not close down Montero successfully prior to each goal, and Angel was operating on the wrong side of the pitch during the entire first half. The lack of movement up front was another issue for Villarreal. Why was Nilmar left on the bench? Ultimately, Lotina went looking for a point, perhaps understandable given their abject away record, and failed.